For those of us who believe in a mass-based, working-class-oriented anti-fascism, it comes down to some central questions. Can we imagine a mass anti-fascist movement in Alabama? Can we actually imagine that large numbers of Alabamians would agree with our program and strategy for fighting fascism? Or do we basically think that mass anti-fascism might theoretically work elsewhere, but not in a place like Alabama? "Outside Agitators" - but who's agitating? The scene in Auburn, AL when we showed up was one of the most bizarre we've ever seen in a political context. Neo-nazi spokesperson Richard Spencer had just been allowed to begin his speech in Foy Hall, after a local judge negated Auburn University’s decision to cancel his event. The live stream showed a packed audience, though some were opponents. Outside, there was a large crowd of students and onlookers. Standing in the crowd, looking to our left and right, it was often impossible to tell if our neighbors were spectators, trolls, anti-Spencer Auburn students, college republicans, or fascists. We were able to identify some people in the crowd as fascists due to their MAGA hats or giant American flags, but they did a much better job of blending into the crowd than many of the anti-fascists did. 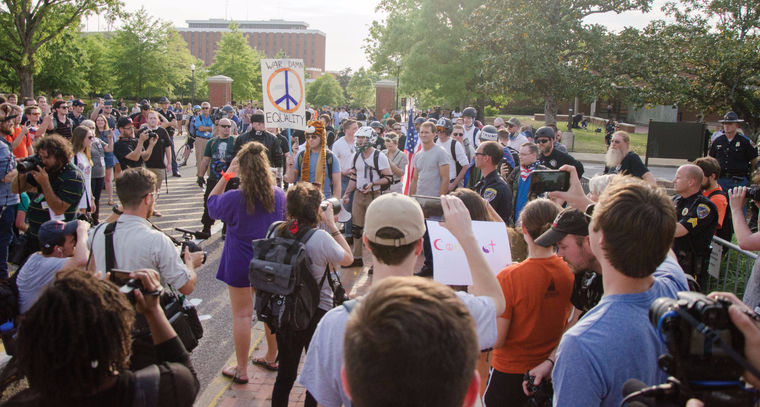 Many of the anti-fascists were dressed in black and were armed in helmets and other aspects of the "uniform" that made them stand out from anyone from Auburn. The most visible fascists themselves were already in the auditorium, which meant that for the next several hours, the only visible “outsiders” for the crowd were the anti-fascists. For people in the crowd, anti-fascism looked like a specialized thing, while the fascists themselves were abstract and out-of-sight. Before we talk more about what happened, let's talk about Alabama and Auburn. 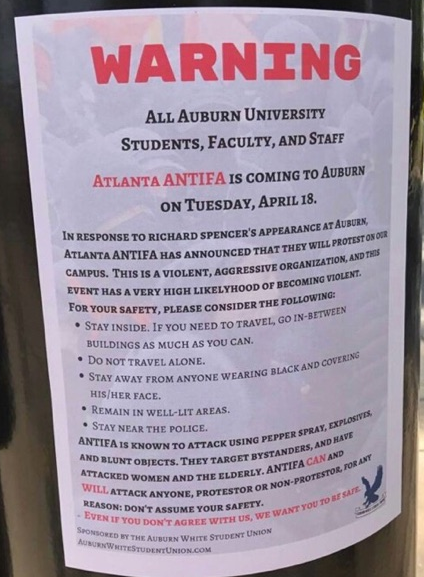 It seems unlikely that many anti-fascists were familiar with Auburn before Spencer’s speech was announced or had ever spent time in Alabama.. We don't mean to score cheap points here. Obviously, most of us have not been to most parts of the US, and may not have heard of every city. However, we think that the US left simultaneously ignores and scorns the South in general and the “deep south” in particular. Furthermore, Auburn - home to one of Alabama’s two main universities - has its own particular culture and significance within Alabama. Think of the biggest deal you can imagine people making of college football - double that, and add a little more for good measure. That’s how important football is for Alabama, and Auburn is their number two school. To say the town’s culture revolves around football, and the state’s culture revolves around the football of the University of Alabama and Auburn University, would be an understatement. Alabama head coach Nick Saban has been called “the most powerful man in Alabama,” and that’s probably not an exaggeration. Indeed, it seems that one of the biggest missteps Spencer took in Auburn was to speak against black football players and berate people for supporting them - attacking Auburn football may have galvanized the school and the town against him in a serious way. There is a dominant stereotype that white people in the Deep South are ignorant conservatives. This stereotype comes from liberal institutions (think of the character Kenneth on 30 Rock), and it carries over into the left if it is not consciously challenged (which it usually isn’t). Of course this contributes to a hostile or skeptical attitude from Alabamians when there is any engagement. There hasn’t been any meaningful Left presence in Alabama since the 70s, and very few attempts by contemporary left groups to engage seriously with Alabama. When the US left spends decades ignoring the deep South, we are telling ourselves and the rest of the world that we don’t believe there’s any meaningful organizing to be done there. The right wing doesn’t make the same mistake. In Alabama, groups like "The League of the South" have open meeting halls, billboards by the highway, and have announced the formation of a “Southern Defence Force”. These questions deserve attention because they had a huge impact on our orientations towards this situation. Entering unfamiliar terrain with preconceptions about the political territory set up a situation that would characterize the rest of the night - a theatrical production of specialized antifascists versus specialized fascists, where everyone else was just in the way. We saw little talk beforehand about how Auburn students might engage, or how we might relate to them. It seems that all of us (present authors included) made decisions based to some degree on a lack of faith in the possibility for mass anti-fascism in Alabama. Most of us would probably say that we think mass anti-fascism is an ideal, preferable to “squad-vs-squad” style anti-fascism. However, in practice we tended to write off the possibility that large numbers of Alabamians might actually agree with our program for fighting fascism if we actually presented it to them. If we want to stop the normalization of fascism, then we have to "normalize" anti-fascism - even (maybe especially) in places like Alabama. There were some attempts on our side to preemptively address some of these concerns.We had designed flyers to explain our positions to the crowd, but due to haste and confusion these were not distributed. There had been some attempts on reddit and elsewhere to connect with folks in Auburn ahead of time, which was a good start, but we should have followed up on them more systematically. By the time Spencer’s speech was starting, the damage had been done - the bloc was isolated and pressed between a police barricade and a crowd ranging from indifferent to hostile. Onlookers, potential allies, and low-key fascists were all intermingled in an incoherent mass, with police scattered throughout. Furthermore it was getting dark, making it harder to talk with people and less likely that people would read or care about flyers. The only clear distinction was between the black-clad antifascist activists (who were visibly not from Auburn) on the one hand and the jumble of people with illegible politics (but generally from Auburn or looking like they could be) on the other. In short: we treated them like "others" who might get in our way and ruin things for us; is it any wonder they treated us the same? As we were arriving, we were seeing messages that people felt "trapped" by the crowd, that the crowd was full of “trolls” and “spectators” and “stupid liberals.” This seemed improbable to us. When we arrived we saw more context. There were several hundred people in the crowd, most of whom looked like traditional Auburn students. Interspersed were small pockets of people dressed in all black. Shortly after we arrived, one of the black-clad people started walking through the crowd, shouting and attempting to agitate them. The crowd quickly felt like it was being yelled at by a person that had obviously marked themselves as separate from the crowd, and subsequently tensed up. People began to crowd around and heckle this person, filming them at the same time. At one point as tensions rose it seemed like there could be a fistfight between this white punk-looking antifascist person and a black person in the crowd - which would have been an absolute disaster the moment it hit the internet. This was just one early example that antifascists were treating the crowd as the "other" and were displaying anti-fascism as a specialized activity, not something for Alabamians unfamiliar with urban political scenes to take up and make their own. The bloc continued to make these kinds of decisions throughout the night - at one point the bloc had managed to maneuver out of the middle of the crowd and down a street. Other people, many of whom looked like frat members, followed closely behind the bloc, seemingly looking for excitement. We worried that as the bloc tried to disperse, some of the people following them might try to pick fights. Luckily, some pigs on bikes zoomed in a divergent direction and led those followers astray, buying the group time and space. The bloc deliberated and decided to head straight back into the crowd, placing themselves again in the middle and riling the crowd up in its procession. This time we were sure that violence would break out - only, a Holocaust denier stole the show and locals congregated around him instead, mostly to confront him . The bloc consistently reinserted itself into the crowd and made itself the object of spectatorship, rather than something the crowd could engage with, or at the very least, accept and act along sides. The spectacle of specialized anti-fascism undermined the concrete possibility of mass anti-fascism. Possibly the most dangerous moment came when about twenty or so people in black were chanting together and were getting hemmed in by the larger crowd. Some of the crowd may have been spectating, some hostile - it's hard to tell. The vibe was already tense when the group began chanting what sounded like "Atlanta, Atlanta, Antifascista". In response, someone in the crowd began an Auburn fight song that none of the out-of-towners knew. Everyone from Auburn immediately joined in, fists pumping, and those of us from out of town were conspicuously silent, confused, vastly outnumbered, pressed in, and scared. It felt like the situation was on the razor's edge of a brawl, which would have have ended very, very badly for everyone wearing black.. By showing ourselves as outsiders, we handed the MAGA bro’s an opportunity to throw a punch and start a brawl, potentially with popular support. Luckily, they didn’t seize this opportunity. After Berkeley, that would have been an absolute disaster, and a demoralizing turn on the national level. Eventually the fascists had to leave Foy Hall. The police had barricades set up so that the crowd was all along the edge of the path that the fascists took towards the edge of the campus. This was part parade, part walk of shame. As the fascists were parading out in full insignia, our people took the opportunity to rile the crowd up and remind them that these were actual, flesh-and-blood nazis, helping to stir up militant chants along the route. It seems that allowing people to actually see that the nazis were real, not abstract and not a joke, did a lot to reorient the tensions - antifa were no longer the only people who were visibly not from Auburn. This was fundamentally different than previous experiences of “spontaneity” we’ve witnessed - and parts of it are difficult to reckon with. This was not a preconceived political act from an organized body, nor was it a spontaneous action of oppressed people who feel powerful in a moment. This was mostly “bro”-looking football fans - many of whom we suspect initially attended as spectators - suddenly catapulted into a political act. It’s likely that the scene of organized, decked-out neo-Nazis riled some students up - they realized this was real, these were really neo-Nazis. It’s possible that some out-of-town antifascists in the crowd were able to effectively encourage a more militant approach towards the nazis at this point. It’s likely many students broke into a run simply because others were running. And it’s also possible that the scene of any visible “outsiders” - be it the black bloc, the fascists, or another football team’s fans - could have roused a similar sentiment: This is our campus, our town, and outsiders are not welcome. One of the central principles of mass anti-fascism is that "we don't cede territory." This means that we should not just assume that the far right has a monopoly on places likes rural Alabama, but instead we should actively seek allies, build relationships, and support the development of an organized anti-capitalist, anti-racist militancy. Many of us are still defaulting to squad-vs-squad skirmishes, but the fascists are not. The speaking events of Milo or Spencer are about recruiting and building a mass base for fascism. We think the most promising way to prevent the development of mass fascism is through mass anti-fascism. The worst thing we can do right now is to keep insisting on the black bloc as the default tactic. This is the path towards catastrophic failure. This doesn’t mean that the black bloc tactic will never be useful in some situations. Keep a bandanna in your literal and figurative back pocket - or keep two in case someone else needs one. But otherwise, we think we might begin by dressing in a way that doesn’t immediately set us apart from the rest of the crowd. The Picket/Guard Training that has been developed by the General Defense Committee identifies some possible roles that can apply in a mass public action, such as picket captain, marshal/security, and MC. We think “agitator” should be added to this list as a possible useful role, especially for actions like this one in Auburn or anywhere else where we will be acting within a larger crowd and trying to raise the militancy and resiliency within it. We envision that agitators can work in pairs throughout the crowd, in coordination with each other and other parts of the group, with the goal of raising the temperature of the crowd, encouraging it to defend itself, or supporting any other goals. Working in pairs allows for immediate feedback if something seems not to be working, or working well, and also allows for better debriefing (and security). Of course, like with any other “role” there should be some fluidity - it’s not to say that only some specialized people will try to agitate the crowd while others don’t at all. Rather, it’s that some people would be focusing on this while others are focusing on other useful tasks. A mass approach requires a higher level of coordination. If we’re serious about confronting fascism-- and doing so in a way that allows for mass engagement and helps develop mass militancy-- then we’ll need to get serious about group cohesion, group discipline, and accountability. As we mentioned above, at one point there was one person trying to “agitate” the crowd but who only succeeded in agitating them against the black bloc. The movement that we need now has to move beyond that kind of individual, unaccountable behavior. "The next most influential man in his state is probably Governor Robert Bentley. But Saban is Nos. 1 through 10 on the list of Alabama power brokers. He would be in the top 10 even without his three national titles with the Crimson Tide. The position itself—head football coach at Alabama—gives you a platform of power. But because of the program's wild success, Saban is the best-liked person in the state. He has the most visible job in the state, and given the religiosity with which Alabamians apply themselves to college football, Saban now has another title: the pontiff of pigskin." Source. There are some interesting overlaps between agitation and “trolling” - this is beyond the scope of this piece, but worth thinking about, especially insofar as all of the time and energy that fascists spend trolling means that they are honing their agitational skills much more than we are. The content of what they were yelling was also problematic. In form, it was antagonistic towards the crowd, treating the crowd as antagonists towards the black bloc. In content, it was about how the black bloc was there to “protect marginalized communities that couldn’t protect themselves” - a racist and vanguardist attitude. At a recent debrief meeting, several of us agreed that we failed to intervene. It’s Going Down reported that the chant was "Alerta, Alerta, Antifascista," but many of us heard it as “Atlanta”, and we suspect the crowd did as well. In contrast, we noticed that we got pretty good responses when we turned some of their football chants against Spencer. We might’ve missed a good opportunity for a “War Damn Antifa” banner. On the flipside - what would have happened if the students had had the “experience” of running antifascists out of town? This piece was also published at Lifelongwobbly. Thanks for posting Oliver. This is great stuff and much to learn from. I think this paragraphs make some really important points. Now I may be remembering incorrectly, but when I moved to NA I thought that the blac block here was very strange. They acted more like an identity and a group than merely being a tactic. In Europe you'd rarely see people being already dressed up as ninjas (as to avoid being nicked on the way to protests) unless they were already in a very large group. The point is that by dressing up in black is that YOU DO NOT STAND OUT and therefore cannot be detained or arrested as easily by the police after you have been fighting them. Wearing black was supposed to guarantee some form of anonymity: not stand out. This means that people joining the black bloc on protests would always bring changes of clothes in their (black) backpacks: change into and out of the ninja uniform when it makes sense. If you're talking to a crowd of normal people, wear normal clothes, if you're about to de-arrest a comrade, it makes sense to suit up. But in NA, you have folks adopting the black bloc as an identity and seemingly a politics in and of itself. Gone are the days when the black bloc used to defend other protesters. See the G20 in Tororonto. The black bloc did their thing and destroyed property, but was nowhere to be seen when the police attacked normal protesters congregating in a park. All the black bloc did was to provide the media with the spectactular images they were expecting. Even when protests are tiny the black bloc folks will come dressed up as nijas. Rather than being anonymous they stick out as sore thumbs that can easily be identified by the police or followed by fascists (at one protest I think the "black bloc" was about 4-5 people!). So yes: out with the black bloc as an identity and in with it as a tactic. In both Auburn and Pikeville it seems like we got lucky and avoided some very bad possible outcomes. These seem like pretty urgent conversations to have before we end up totally marginalized. Me too, given how many other threads there are on this topic and how practical your write-up was. Now, more people may have read it, but I wonder why the people who were posting on those other threads haven't even mentioned it. I found your collective comments about Auburn to be excellent and it's been making the rounds in our left commie circles here in the Bay Area. Also, in an e-mail debate with North American ultra-lefts, it's been posited as exemplary of the types of interventions and analyses we all should be doing. In Berkeley, the composition of the anti-fascist protesters has been pretty fluid and it's been hard -- for me at least -- to accurately pinpoint who's behind the masks. At the Milo event they were more college-aged, while the showdowns at Provo Park seemed to have more high schoolers and skateboarders who regularly hang out in the west end of the park. "Based Stickman" got arrested on April 12, 2017 while harassing those kids and got whacked on the head with a skateboard in a provocation in the park in advance of the "Patriot" demo on April 15th. As I've said elsewhere, these events have all been shitshows and it's been hard to objectively critique them. Your analysis of the event, after seeing the video you had posted, was a breath of fresh air. Iʻve seen a lot of sectarian left folks, even Jacobin/DSA folks taking a smug attitude toward the recent uptick in alt-Right and openly fascist organized rallies, marches, and attacks on the Left. Your piece engaged in the critique others pretend to, without merely throwing "the black bloc" under the bus. We need detailed and thoughtful self-critique that is done in a comradely way. Iʻve seen a lot of people say "more like this please!" in response to your description of the Auburn event. From the UK I found this article very interesting and helpful. Thank you! It's a real shame that the two students who made that video ended up taking it down.